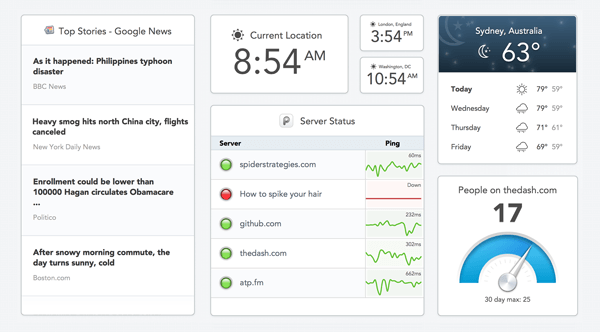 Dash is web-based dashboard software. Sign up now and get one free private dashboard forever. No credit card required. Dash makes their money from business accounts. You can manage your team with advanced permissions and the convenience of centralized billing. It’s everything you need to securely share dashboards within your organization. Pricing is $795 per year for 5 users, and includes all the dashboards you need. Free accounts include one private dashboard. Signup is fast and painless. ‹ Previous Post How close is the UK to smartphone saturation?